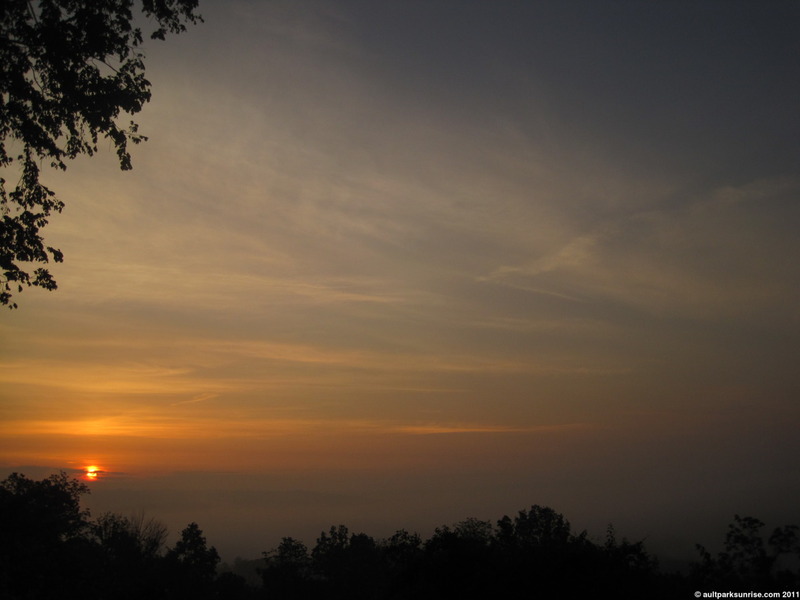 The haze of the fog made some of the pictures appear to be blazing in light. 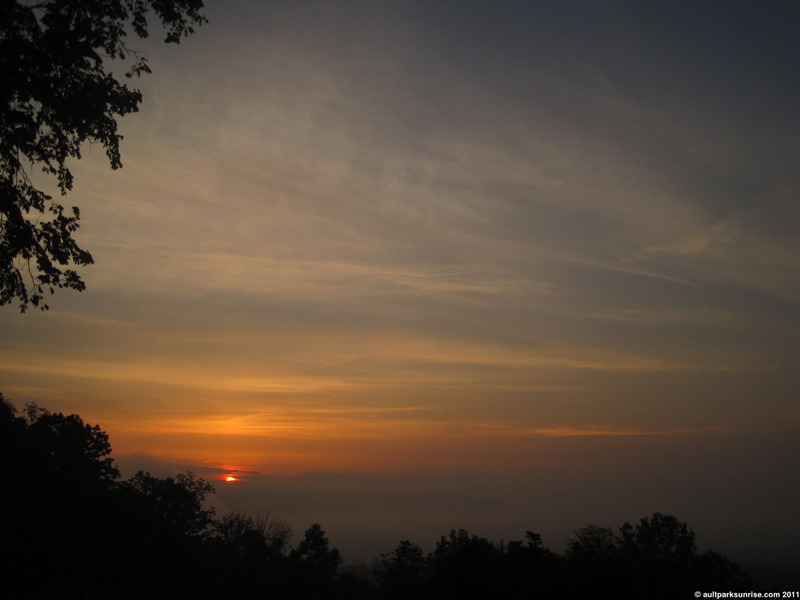 A final view of the sunrise. Notice how far to the left the sun is getting from this view @ Heekin Overlook. 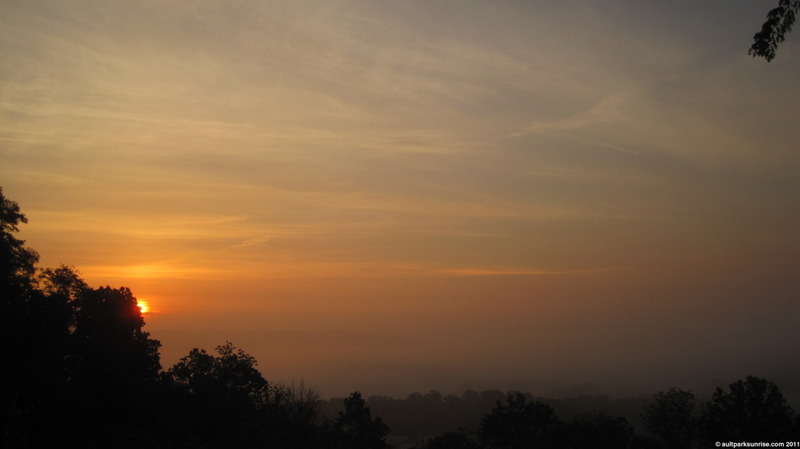 I now have to go down to the lower overlook to get a full view of the sun. Interesting. I imagine it will hang out about at this location until the middle of June. 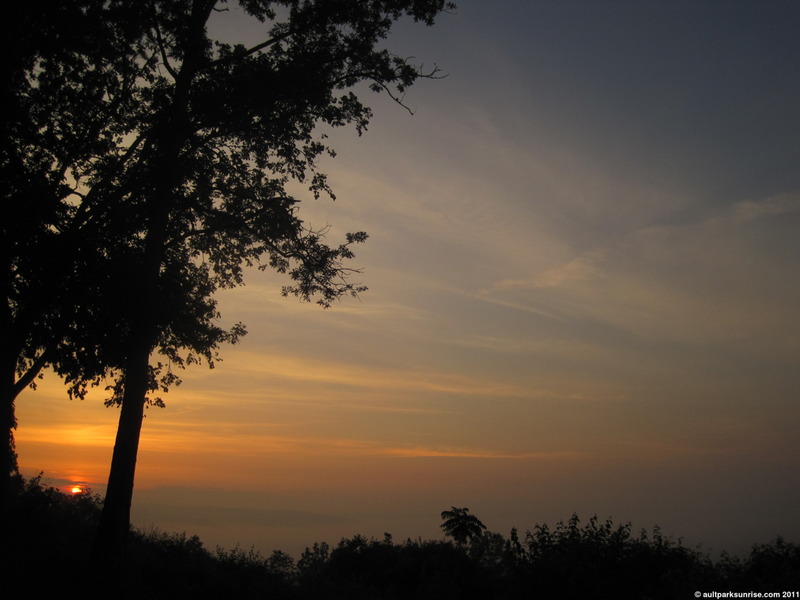 Once the sunrise time starts to get later after bottoming out at 6:11am, I imagine the sun will start its journey back to the right. 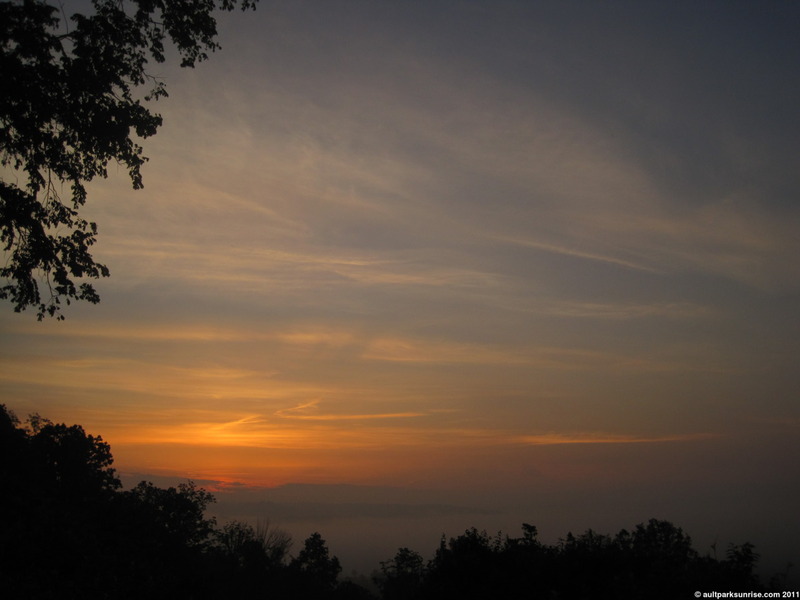 I became curious about that fog that I saw when I first woke up this morning down in Mt. Lookout. 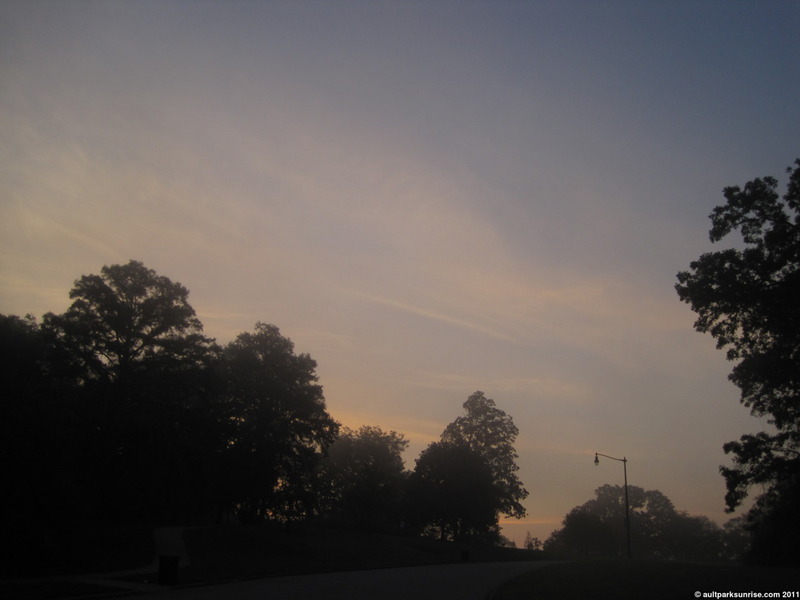 I wondered if Alms Park had patches of fog, too? I decided to quickly jog over to the other park and see for myself. 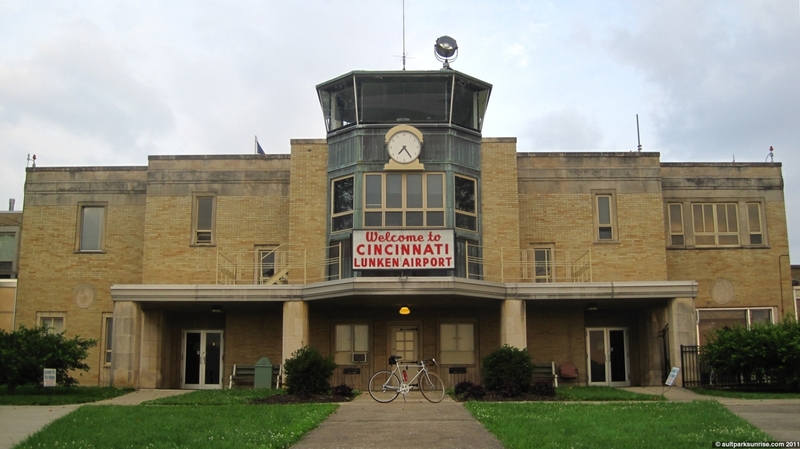 As I made the 10 trip to the western facing park, I started to think about Lunken Airfield. I realized that there wasn’t much fog in the area by the entrance to the park, but as I looked down the side streets that traversed down the hill, I could see the streets disappearing into a foggy obscurity about 100meters down the mountain. 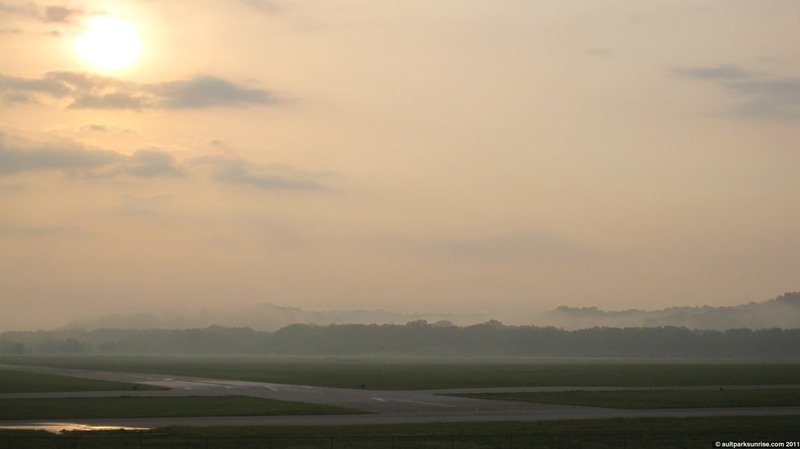 I decided that since I was already halfway to Lunken Airfield I might as well make a morning out of it. 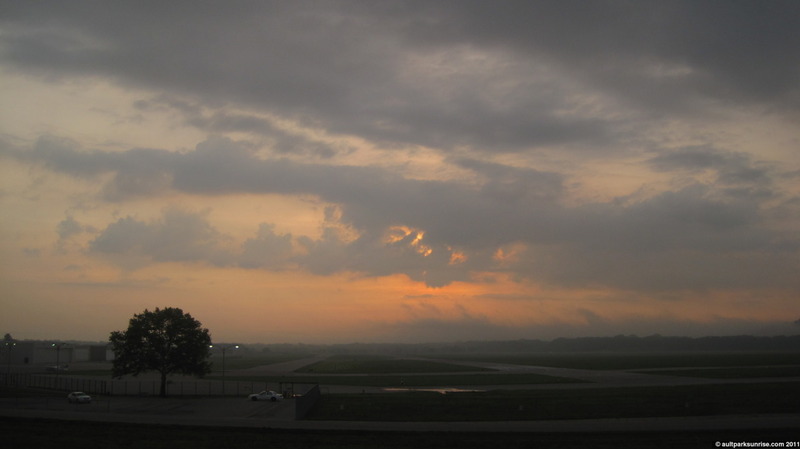 I’ve been meaning to see what kind of sunrise vantage point the bike trail around the airport provides, if any, and with only 2 official sunrises left before I hit 40 now seemed like the perfect time to check it out. 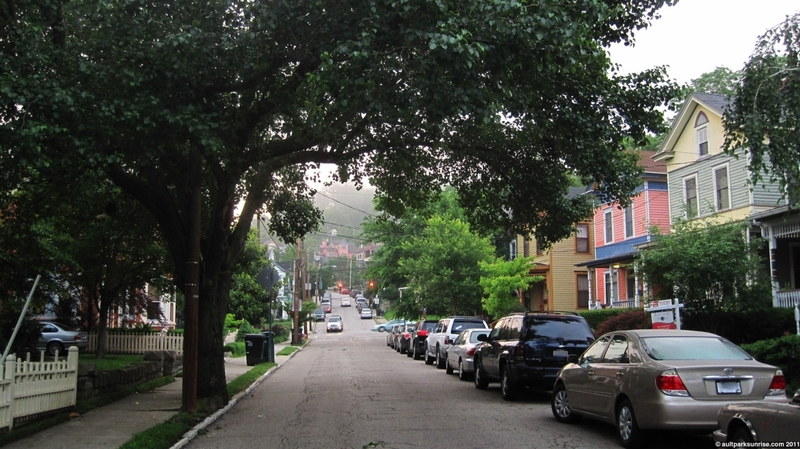 At the base of Tusculum (In this picture we’re looking back up the hill I just came down) is a beautiful little neighborhood of only a few blocks that really reminds me of some of the old neighborhoods in New Orleans. It is lush with thick trees, 100-120 year old homes, and is clean and well kept. A hidden gem of the area, in my opinion. At this point I’m down in the basin, at river level elevation. The ride down is fun (but you’ve got to be careful), the ride back up is painful but satisfying. You’re also witnessing my first ever attempt at “photoshopping” – but I actually used The Gimp (no photoshop on linux) – to remove the license plate numbers from the two cars on the right side. Success! 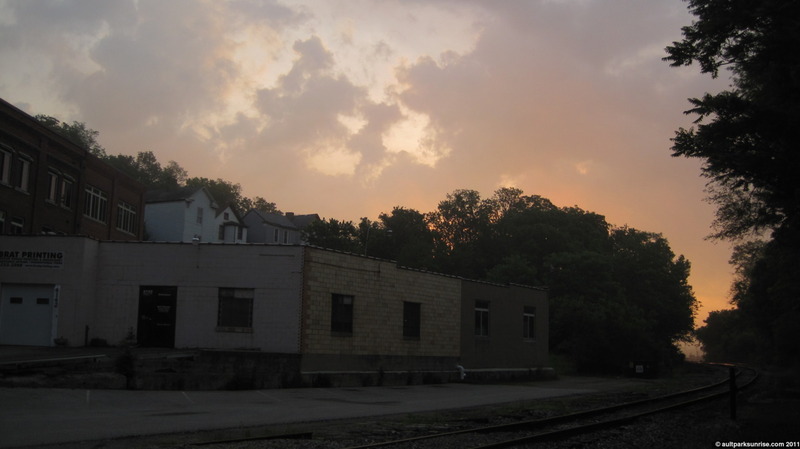 Along the way to Lunken I pass through East End. There are so many hidden buildings in this area that mark the river boom of the mid to late 1800s. I continue by most of them, vowing to return soon in a future explorative mission. 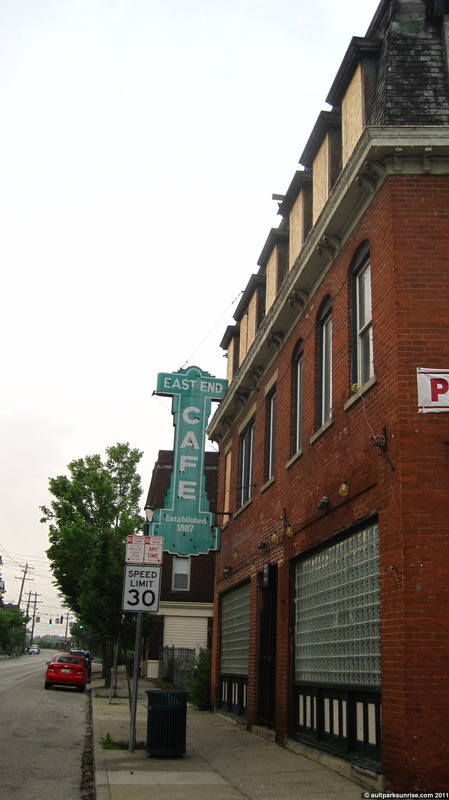 I can’t help stopping to take a picture of the “East End Cafe”, a neighborhood pub that claims to date back to 1887. 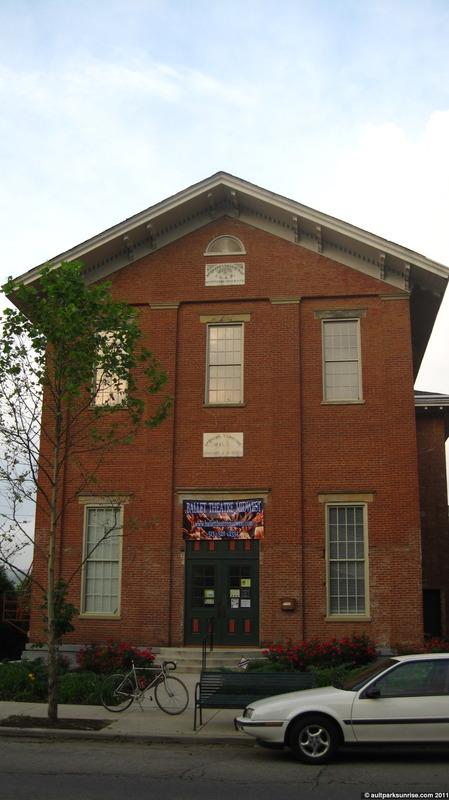 The Internet tells me that this building is the “oldest continuously operated live music venue” in Cincinnati. I come across the rail lines (now west of the crossing I made a couple weeks ago). 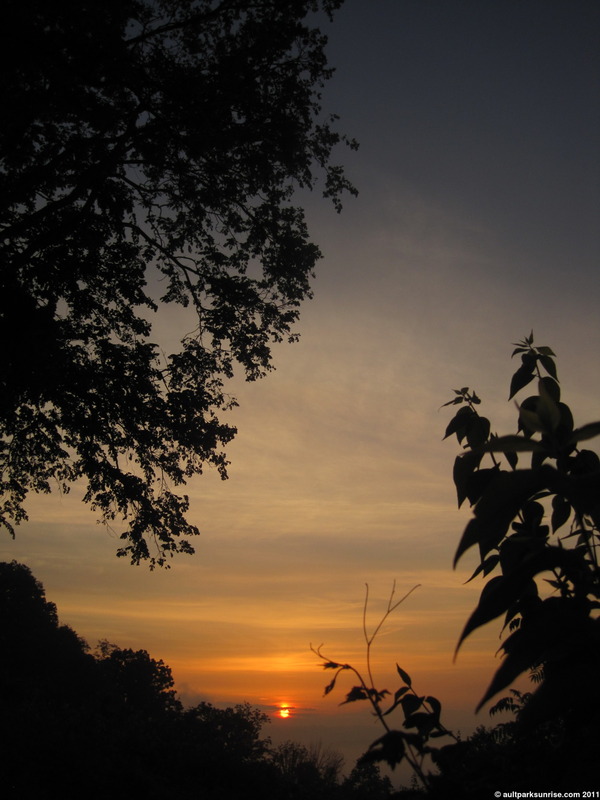 The sunrise, fortunately, is still blazing up in the sky. I’m hurrying at this point, because I thought originally that I would have had a bit more time before the sunlight punctured through the thick fog in the valley. 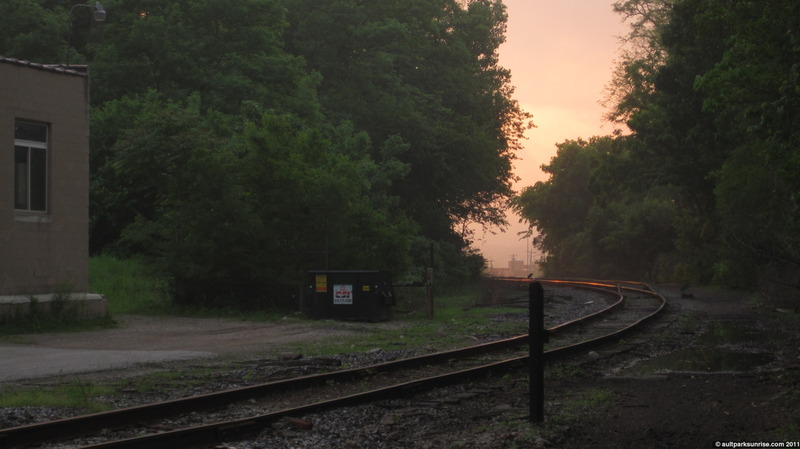 The sun coming through the trees as the rail line splits in two. 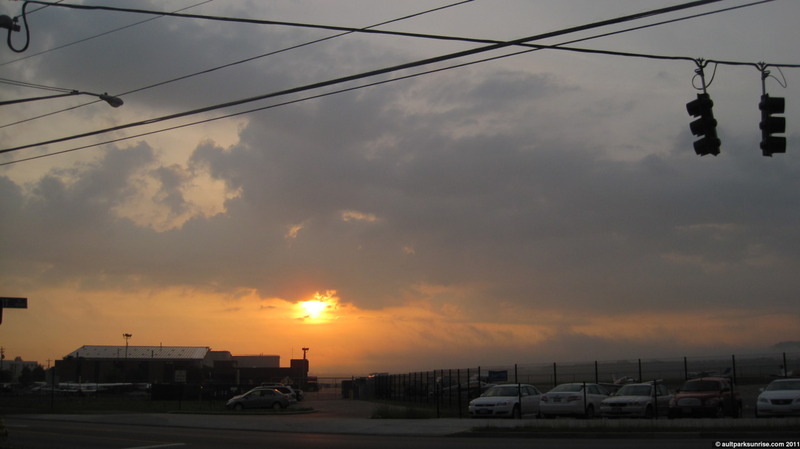 As I pop out from the side street into the Lunken Airport campus, I notice that the sunrise looks spectacular from this point. 25 minutes have passed since the sun crested above the horizon, and it now appears that I might have missed the most brilliant part of the show. 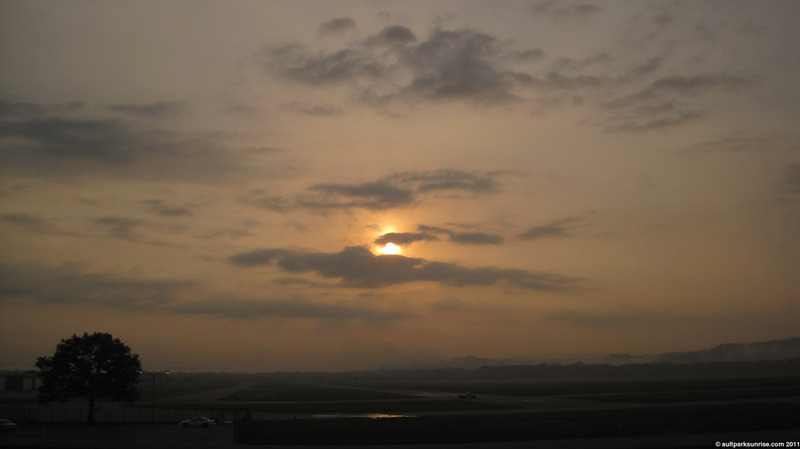 The sun looks as though it is about to sink up into the clouds. Is that the fog? Or is it a new cloud bank? 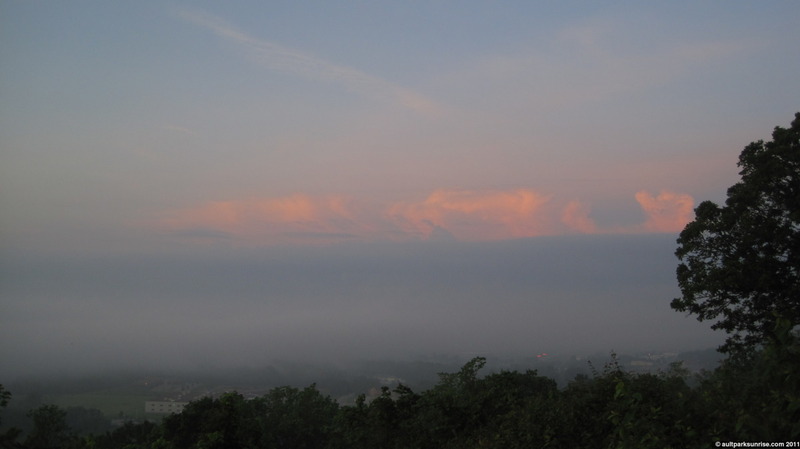 Or is it the western cloud bank I saw from Ault Park? I have no idea. 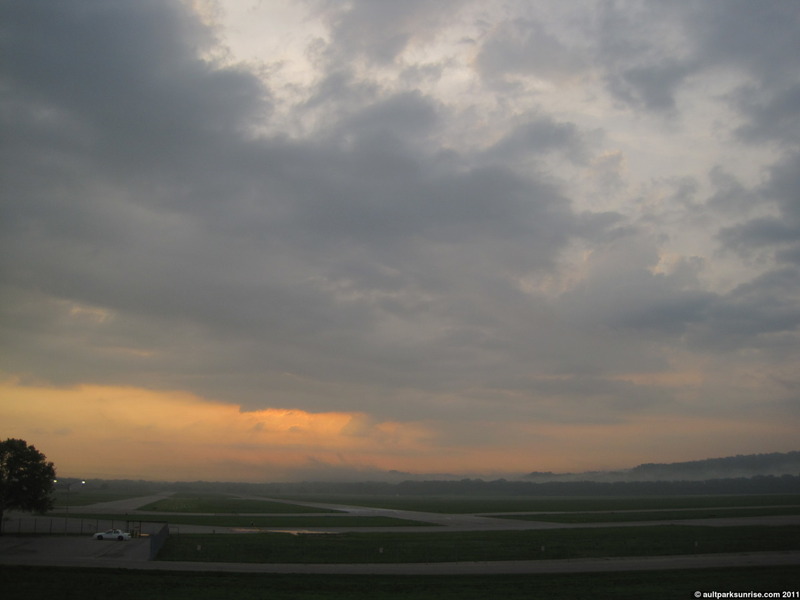 Looking East we can see the fog still being blown off of the valley basin. 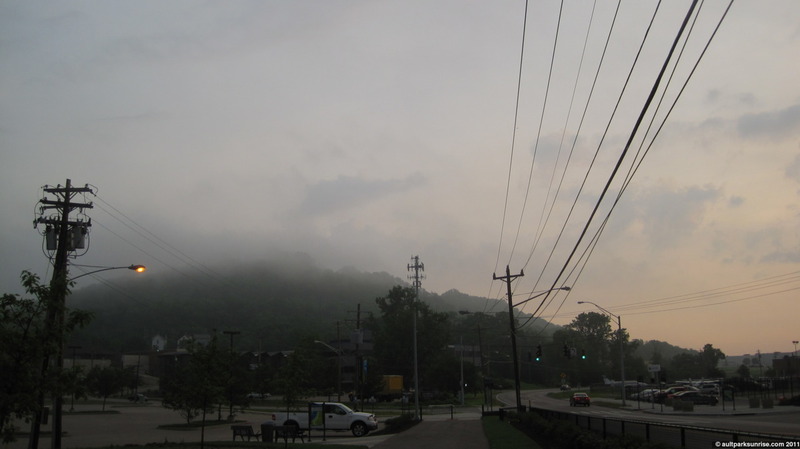 Up at the top of that hill, right where the fog is, is the western overlook in Alms Park. It looks like I would have got some foggy pictures after all, had I not decided to continue down the hill. You can see the vantage point from the park on some earlier posts. 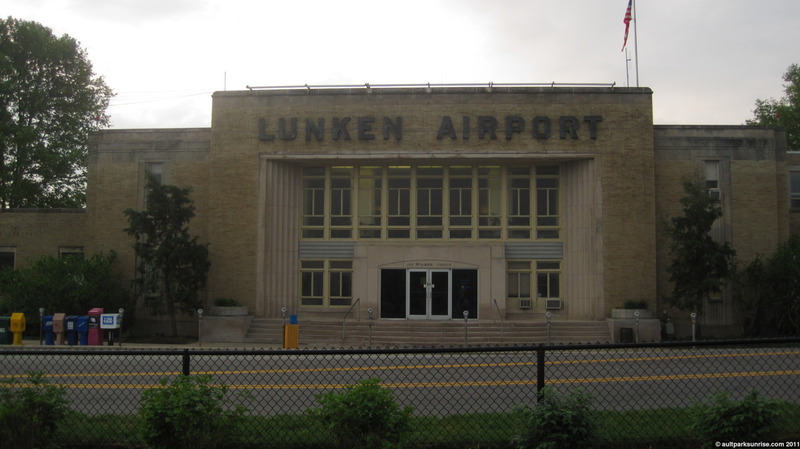 The Lunken Airport Terminal. Classic 1930s deco style. It is just beautiful inside with marble floors and the Sky Galley restaurant and bar. 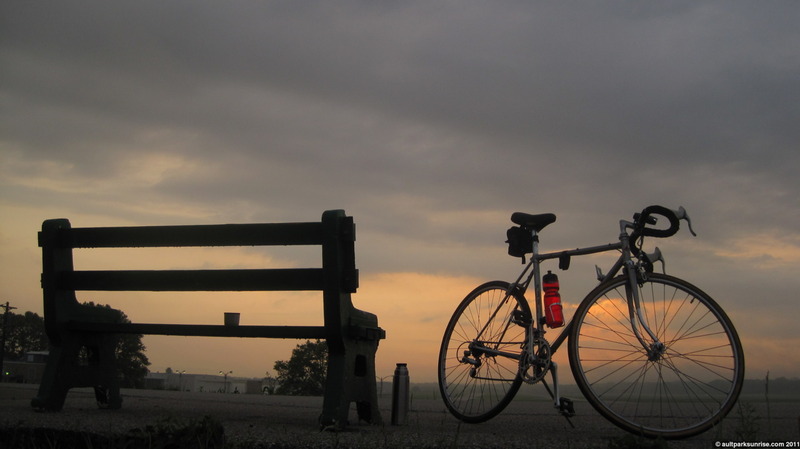 I climb up on the bike path entrance next to the terminal and find a bench to sit on. Finally, my first (second, third) cups of coffee! It appears I have indeed missed the best part of the sunrise, but all is not lost. I now know it only takes 20 minutes from Ault Park to get here, probably only 15 from Mt. Lookout Square. I may be back here tomorrow if the storms hold off. My command station on the bike path. 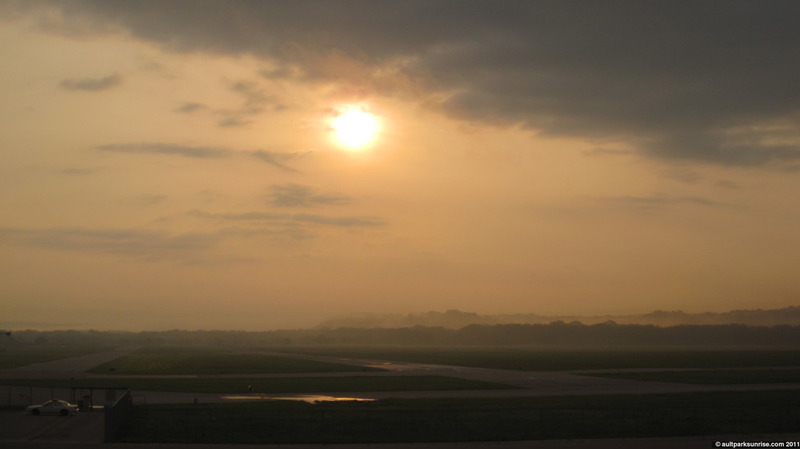 Looking east up the jet runway. The levee to the right holds the true Little Miami river basin. 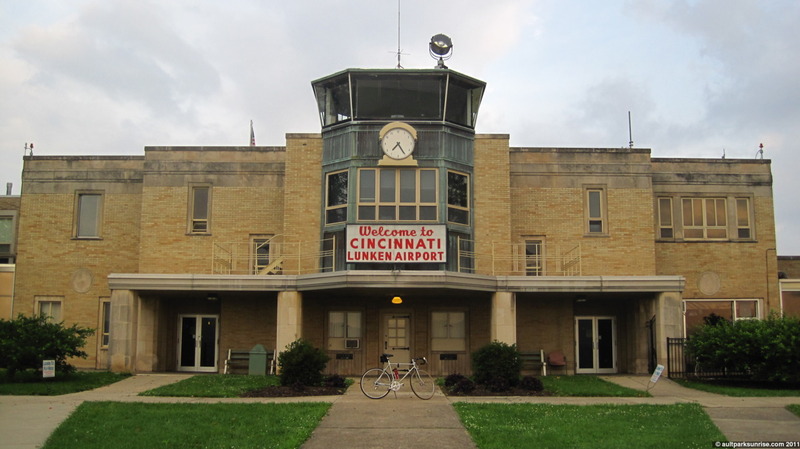 The 5 mile bike trail loops around the airport. I didn’t venture too far away from the terminal. I wondered what a black and white picture would look like. So I took one. The sun decided to come back out as I was about to head back home. Close up of the fog and the sun. 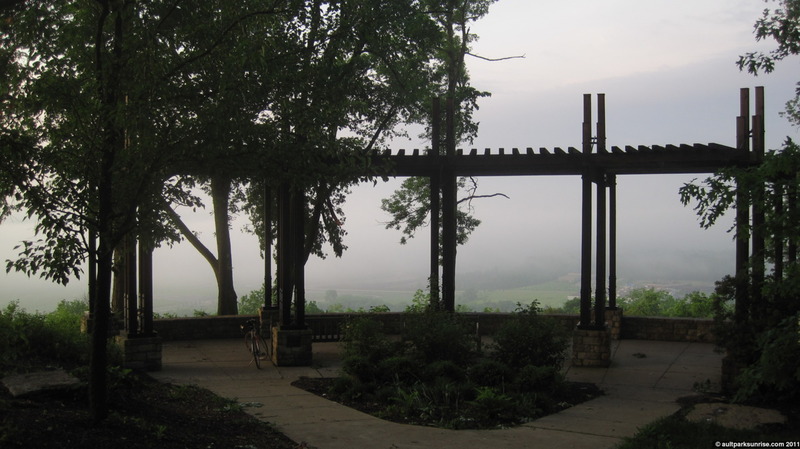 I wonder if I am actually sitting in that fog I saw from Ault Park? 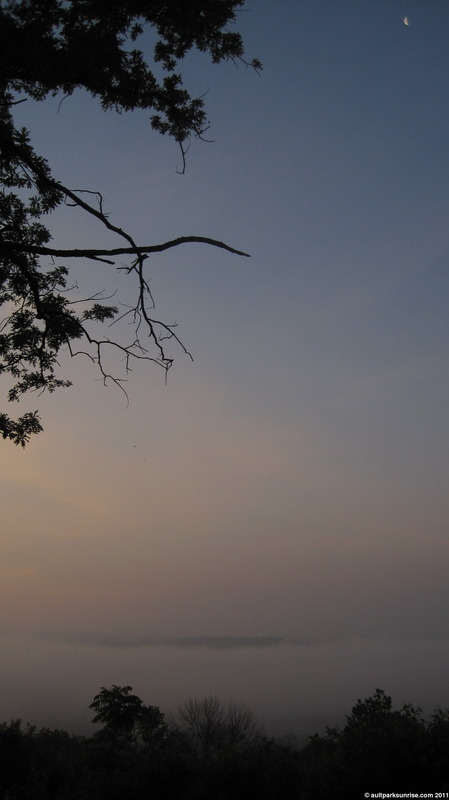 It is so hard to tell up close whether the fog is above me or if it has indeed faded away. 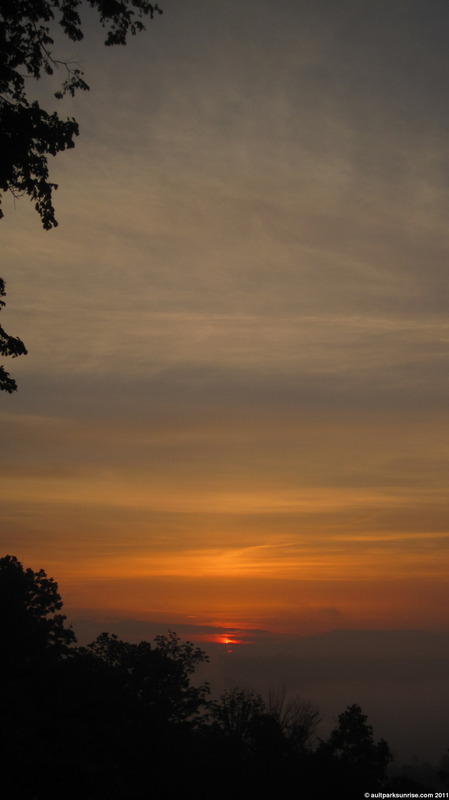 Final shot of the sun over Lunken. The back of the terminal. This building is still used, and it makes me happy to my core to see the old clock still working and on time. I love the old design pattern of building giant clocks into the walls of a building. Now-a-days we have no need for these mechanical giants given that we all have probably 5 time keeping devices within hand’s reach at any given time. 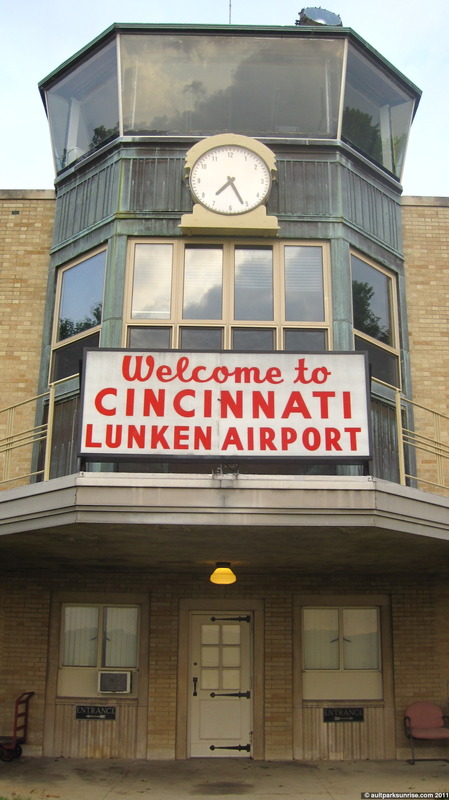 Welcome to Cincinnat Lunken Airport! On the way home I had to pass many historic buildings to save them for another day, but I couldn’t resist taking this picture. I found this building two days ago on a bike trip in the evening to Lunken. This building now holds the record for being the oldest I’ve found yet. 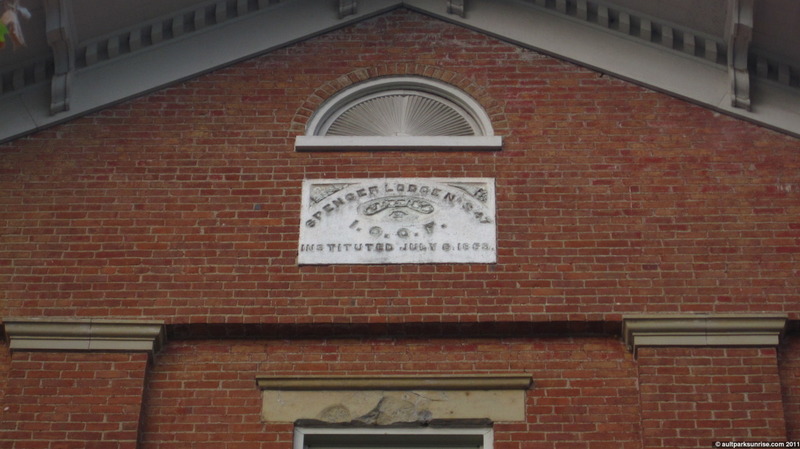 It was built in 1860 and served as the Spencer Township Lodge. 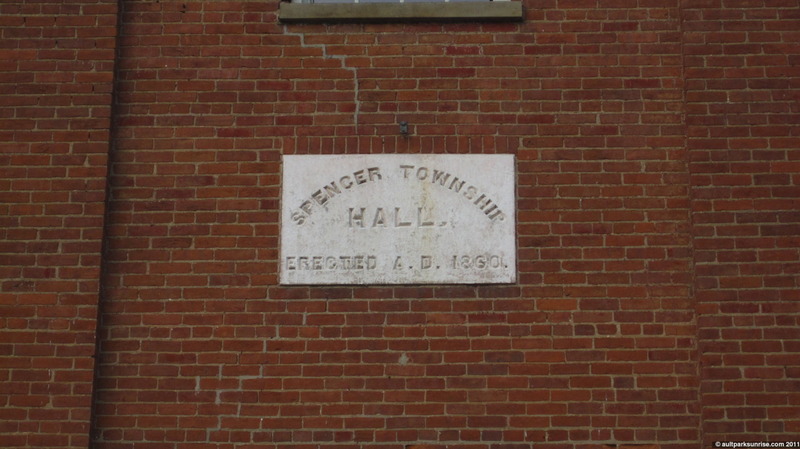 Not sure about the history of the building, or what it is used for now, but this historic article talks about the Spencer Township history in great detail. It appears that the area known as East End, Columbia, and Linwood were once villages that were a part of “Spencer Townsihp”. 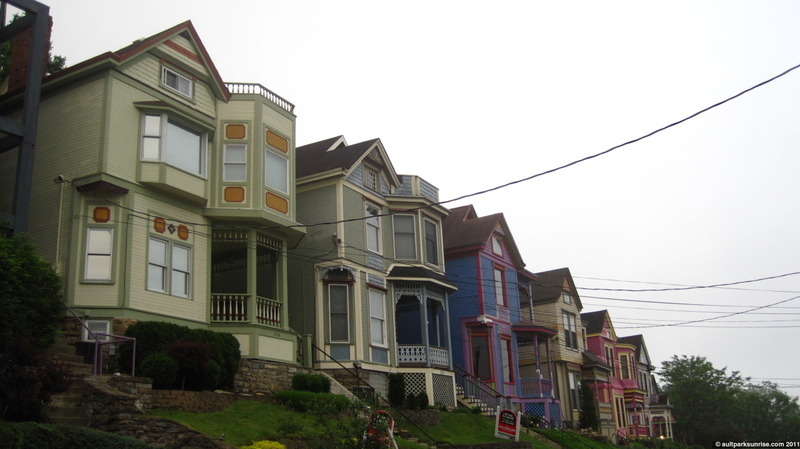 Now they have been emancipated into the Cincinnati “proper” city lines. 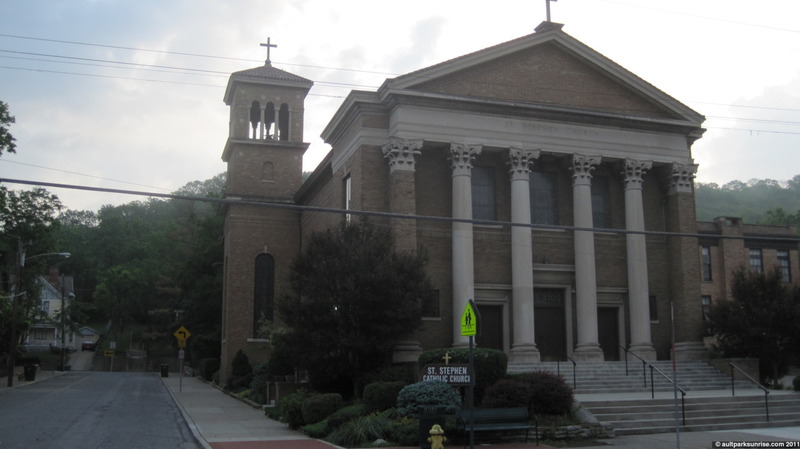 Across the street there is the St. Stephen Catholic Church. After my recent introduction to the “Italianate” style, the tower on this building stands out incredibly. It is almost identical in style to the radio tower @ the US Playing Card Company and the Linwood Public School. 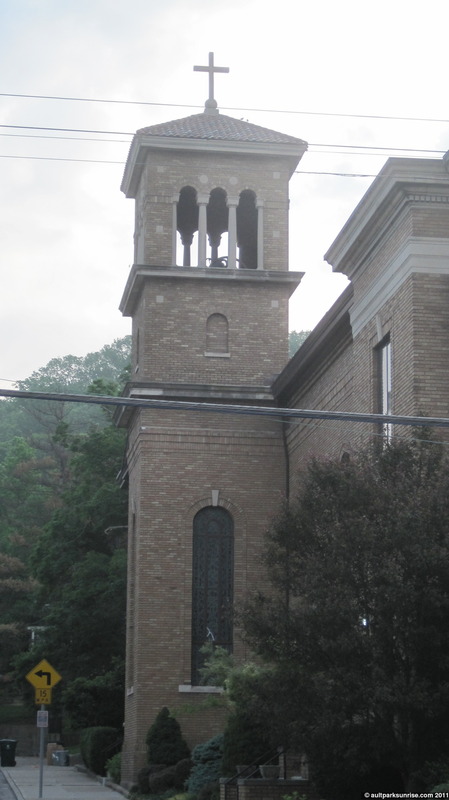 The church’s website says they’ve been serving the catholic community since 1867 – within a decade of the Spencer Township building and just 6 years before the Linwood Town Hall (which in 1903 became Our Lady of Loretta Roman Catholic Church) located just a half mile or so from here. Close-up of the tower. I’ll have to return in the evening some time to get better lighting – it is difficult to take a picture of something against a bright overcast sky! 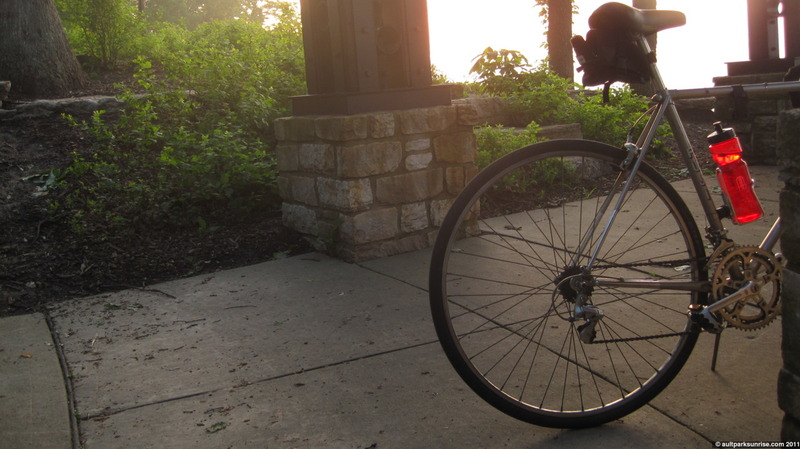 This entry was posted on May 25, 2011 by Ault Park Sunrise. 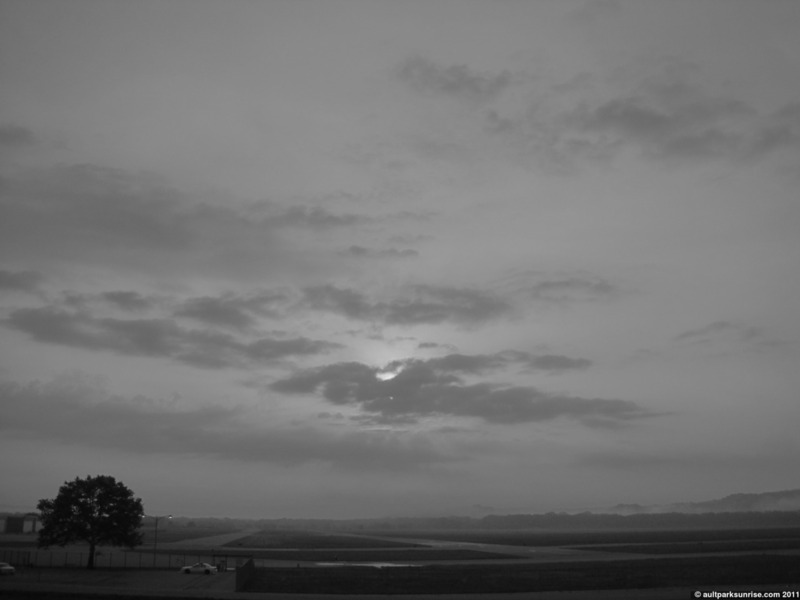 It was filed under ault park, columbia tusculum, east end, slightly cloudy, sunrise and was tagged with ault park, biking, churches, cincinnati, columbia-tusculum, east end, history, italianate, linwood, lunken, spencer township, sunrise, urban.